Work on the Doha Metro ... more than 1 million cu m of Preprufe Plus is being installed to provide long-term protection. 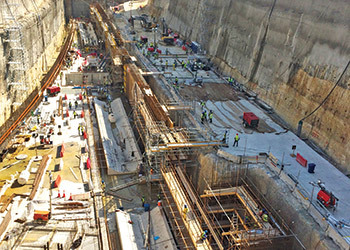 With modern underground transport networks designed and built to offer a service life of more than 100 years, the sealing and waterproofing systems have become a vital specification, says DAVIDE TERRONE, specifications manager Middle East, Grace Construction Products*. Metro and underground railways are commonplace across the globe. These vital transportation infrastructures must be built for the long term so construction standards for new tunnels and below-ground stations are exceptionally high. Underground stations require a dry environment to ensure continued operations, user safety and aesthetic appeal. Water and moisture intrusion, as well as structural and aesthetic deficiencies in concrete, can cause significant damage to the mass transit infrastructure, resulting in high replacement costs, lost revenue, and serious disruption in travel. 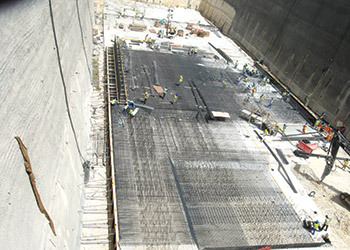 In the Middle East, particularly in areas around the Gulf, below-ground concrete structures are required to keep out water whilst withstanding severe ground conditions – including levels of chlorides and sulphates in the groundwater which far exceed anything found in Europe or North America. Without a high-performance waterproofing membrane, these below-ground structures would suffer early deterioration due to water penetration, resulting in corrosion of reinforcement, scaling, cracking and water ingress to the internal environment. The most suitable solution is to utilise an impermeable barrier that not only restricts moisture or water movement into the building, but also stops water migration between the waterproofing membrane and the substructure. A high-performance bonded waterproofing membrane will improve the concrete’s long-term structural performance and durability by providing constant protection from sulphate, chloride and water ingress. With the correct waterproofing specification, water migration can be prevented with one relatively simple application. Grace Construction Products’ Preprufe is the reliable, practical and effective solution to the risks of water migration on any project, large or small. The unique Preprufe adhesive bond to poured concrete fully localises any leak to keep water outside, ensuring the transport network keeps on moving. Preprufe, which incorporates Advanced Bond Technology, consists of layers of HDPE (high-density polyethylene) film, synthetic adhesives and a weather-resistant coating, providing an impermeable barrier, in which water, salt and sulphates cannot pass. Unlike other membrane systems, the Preprufe waterproofing membrane does not rely upon hydration processes or swell in contact with water, and can withstand a 70-m head of water. It is lightweight, flexible and versatile and truly waterproof, remaining sealed to the structure, regardless of any ground settlement. It can also be applied on wet substrates and is immediately ready without protective layers to receive rebar installation, proving to be a faster and simpler application than many other waterproof membranes. Preprufe can be installed up to five times faster than a traditional loose-laid PVC (polyvinyl chloride) system with welded seams and compartments. Doha Metro ... Grace products were chosen for their reliability and ease of use. Preprufe has been used at high-profile, challenging and widely varying transport and infrastructure projects across the Middle East and beyond, including the Haramain High Speed Railway and Riyadh Metro projects in Saudi Arabia and Qatar’s expanding Doha Metro system. The system’s continued success at these complex and demanding developments demonstrates its versatility and effectiveness as a below-ground waterproofing system. At the new multi-billion-dollar Doha Metro system in Qatar’s capital city, more than 1 million cu m of Preprufe Plus is being installed to provide long-term protection against groundwater, an average annual temperature of 32 deg C and chloride and sulphate attack. Set to become one of the world’s most advanced rail transit systems, the Doha Metro will consist of four lines – blue, red, green and gold – and approximately 100 stations when complete. To be built in two phases, Phase One includes the construction of two major stations at Msheireb and Education City and 30 other stations by 2019, with the second phase delivering more than 50 stations by 2026. Contractors on the scheme required a reliable and high-quality waterproofing system that would keep the stations ‘completely dry’, and with a 120-year design life. For Phase One of the project, four of the five main contractors specified Preprufe Plus for use predominantly below the bases of more than 30 stations and cast onto diaphragm walls in a number of additional locations. No other system on the market protects a substructure from the harmful effects of water, vapour and gas better than Preprufe. It can also be applied on wet substrates and is immediately trafficable after installation, which makes for fast and easy installation. To complete the comprehensive waterproofing specification, Grace also supplied its Bituthene 8000HC self-adhesive membrane to provide a continuous post-applied waterproofing barrier system where the outside of the walls can be accessed. “We have been manufacturing Preprufe for 21 years, mainly for basement construction,” says Grace’s global projects manager Rob Hossell. The success of landmark transport projects which have used Preprufe perfectly demonstrates the importance of specifying a geomembrane which is fit for purpose, economically and environmentally sustainable and delivers waterproofing performance like no other system on the market. Proven to deliver in the most challenging environments, Preprufe continues to be chosen to protect many of the most important infrastructure projects worldwide. *Grace is a leading global supplier of catalysts, engineered and packaging materials, and specialty construction chemicals and building materials. The company’s three industry-leading business segments: Grace Catalysts Technologies, Grace Materials Technologies, and Grace Construction Products provide innovative products, technologies, and services that improve the products and processes of its customer partners in more than 155 countries around the world. Grace employs approximately 6,500 people in over 40 countries. Its 2014 net sales were $3.2 billion.